Ma May street is also the oldest existing ancient house, usually in the form of the tube, but the long narrow front, some do not get wind in the middle. To remind a street name people to remember the ancient house at 87 Ma May with cultural events are often held here, the temple Nguyen Trung Ngan, remember the Black Flag Army anecdotes abducted children and teach customers address water outside the home cooking at 25 Ma May. Ma May is really the business streets, bustling service, mainly serving visitors to the tourist office, hotels grow up close. Length of streets beginning Hang Bac– Ma May junction to Hang Buom, curving form of a curved shape is very different paths to the other town. Ma May is the name of the second pair is the ancient streets Hang May and Hang Ma (other Hang Ma near Dong Xuan market), which is known street of the two streets. The segment of old Hang Ma often serves as funerals, wedding, worship. While old Hang May is making goods appliances made from rattan and rattan fiber material. History books record that the treet’s land borders of the Huong Tuong, Ha Khau ward, while the Hang Ma belong Dung Tho village. This area near the estuary Lich River connect Red River,trading boats in crowds, traders often on Hang Ma and exchange, buying and selling goods. 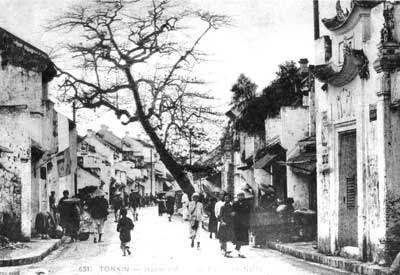 French colonial period, Ma May street, also known as the Black Flag Army street which is general headquarters of the Black Flag Army, a group of Northern troops from the country had drifted to cause terror to make the French and Vietnamese. Initially, the Black Flag Army was the Nguyen dynasty accept to combat bandit on the border. When the French invaded North States Army Black Flag French participation in the battle, had killed two commanders of the enemy in Cau Giay make sure the French terror. They also become frightened of people so as looting, harassment or kidnapping, especially children. Historian Professor Le Van Lan said that: “My house in Ma May, formerly I lazy eat, my mother often warned not to eat the Black Flag Army will start there.” Professor since then, this street is a center of kidnapping children for ransom. Black Flag Army abducted children here, but do not know how to exploit children for ransom to be, challenged by four children locked in a room, for a night of fasting one day, next morning laid out a series of flower soup, very hot white porridge called the children to eat. The children from poor families, used to eat porridge, hungry bring porridge drink around, they will cast out. But whom did not used thisporridge, only eating delicacy do not eat food like that even dainty, we recognize for ransom. It was the childhood memories of Professor Le Van Lan on this street. French colonists established the jail to detain prisoners at the No. 5 Ma May, well before the Black Flag Army headquarters, the French prison in the opposite way. This prison was set up before the Hoa Lo prison. Ma May street is also survived the oldest lot, usually in the form of the tube, but the long narrow front, with no wind in the middle range. 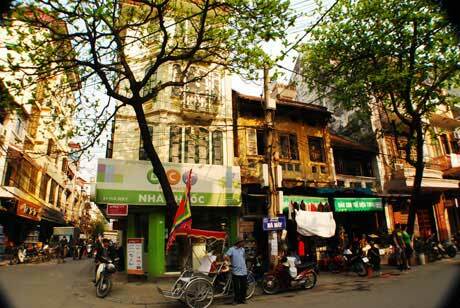 If all of Hanoi old quarter around the neck, the 1000 ancient house that Ma May accounted for 1 / 10 the number of old houses, old houses in which 87 Ma May is preserved quite intact, became the center organizes cultural activities and the sights not to be missed for visitors arriving Hanoi’s Old Quarter. 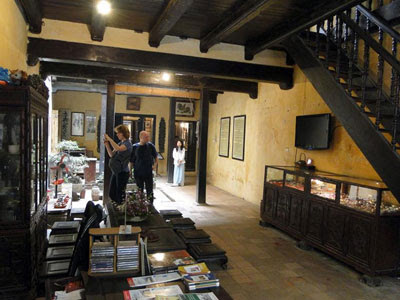 In 1999, the house was renovated in the pilot project for conservation of the old town between Hanoi and the city of Toulouse (France). Ma May house no 87 is typical spatial layout for residential architecture built in the early 19th century and intended to be in sales. Home shows the technique and art of the traditional construction of ancient streets. 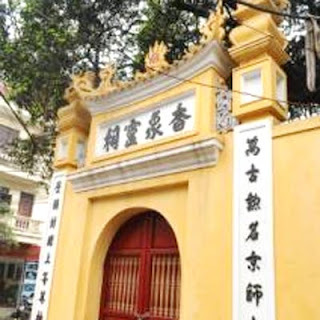 Ma May temple, 64 Ma May worship Nguyen Trung Ngan, who works under the 5 reign of King Tran, each person holding Dai Doan Kinh Su, head of Thang Long, like the People’s Committee Chairman of City now. At the temple are still kept 6 of the third deified monarch Le, Tay Son and Nguyen, along with seven stone tablet. The contents of all epitaphs are a rich repository for the historic name, the name of the land, the specific events of local celebrities. Home at 25 Ma May street of Ms Anh Tuyet, a culinary artist, culinary become the pure Vietnamese food in Hanoi and for foreign visitors. Ms Anh Tuyet as the Hanoi original, creative passion for good food, has introduced the culinary arts of Vietnam in Hanoi and the world by road travel. Stories, many tour operators take visitors to and now she has expanded into both the 22 Ma May.In the early days of new year, the travel itinerary to welcome Tet in Vietnam, visiting Hanoi’s Old Quarter, Ma May is the place attractive, attract foreign tourists to visit, learn about culture, Hanoi human history.